Despite careful control, we do not take any liability for the contents of external links. The operators of the linked pages are solely responsible for their content. The EU Commission provides an online platform for dispute resolution ("OS Platform"), which can be accessed via the link http://ec.europa.eu/odr. If the customer is a consumer resident in the European Union, it is possible to use this platform for out-of-court settlement of disputes about contractual obligations arising from online purchase contracts. The seller is not obliged to participate in a dispute resolution procedure before a consumer arbitration board and is not prepared to do so. 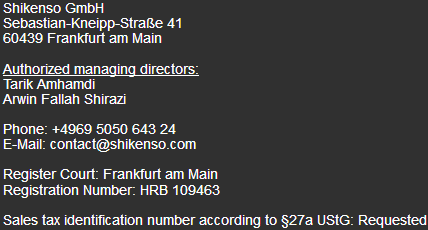 Shikenso GmbH reserves the right to make changes and additions at any time. Despite careful examination of all contents, Shikenso GmbH does not guarantee the accuracy and completeness of the information provided. Shikenso is not affiliated with Blizzard Entertainment.